Duke Law Firm, P.C., with offices in Lakeville/Livonia, New York, and Henrietta/Rochester, New York, offers exceptional legal assistance in the areas of family law and bankruptcy. Susan K. Duke, Esq., attorney at Duke Law Firm, P.C., has the background and in-depth knowledge to assist you in bankruptcy and family law matters. Concentrating only in family law and bankruptcy has allowed Susan Duke to gain the expertise necessary to achieve the best result possible in your case. For over 18 years, Susan Duke has helped clients navigate the minefield of divorce and child custody cases. Her experience and personal attention sets her apart from most attorneys in the area. Her goal in divorce and custody cases is to resolve matters quickly and with as little animosity as possible in order to allow the parties to move forward with their lives and collaborate on parenting their children into the future. Should the matter require litigation, however, clients can count on Susan K. Duke to advocate for them aggressively in court. Endless phone calls from creditors can be extremely stressful. Sometimes, bankruptcy is the best option to end collection calls, foreclosures, wage garnishments, bank account restraints, and to save assets. If bankruptcy is not your best option, Susan Duke will let you know this during your free initial consultation. The firm's legal assistant, Stacy McKinney, has also been assisting bankruptcy clients for over 10 years, and her knowledge and involvement assures a smooth path from filing bankruptcy to debt relief. In choosing a firm to represent you in bankruptcy proceedings, be sure to do more than check the price; be sure your attorney will have the skill, experience, knowledge and attention to detail necessary to avoid your bankruptcy case becoming a nightmare rather than a path to stress relief. 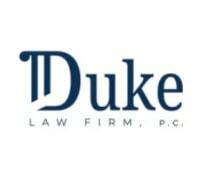 Contact Duke Law Firm, P.C., for a free ½ hour consultation regarding your case.